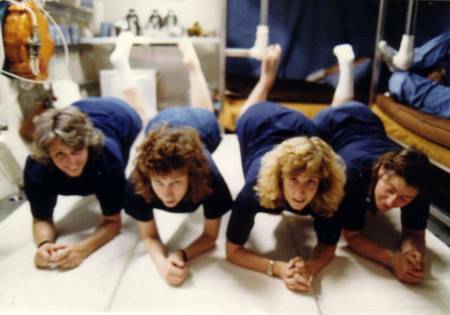 The ladies wanted a group photo to commemorate their eight-day stay in the chamber 'lockup' so one of them set up the camera and set the self-timer while the others posed. Then they waited. Just as the shutter tripped, a few of them started to move to see if the self-timer was working. The shutter speed was slow because of the low light level in the chamber, so this interesting blurred photo was the result. This was the only photo showing all seven together during the actual test. The men didn't get a comparable photo. Test Director's console in the control room. Test personnel were at test stations throughout the 16-day test although major test operations took place during the day shift and fewer personnel worked the midnight shift since the test crew members were supposed to be asleep. 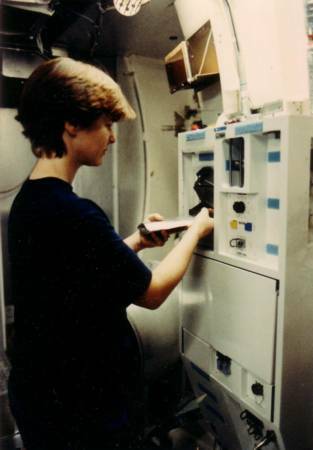 Crewmembers sealed inside the air tight cabin of the Shuttle orbiter face the same life support problem faced by someone locked inside an abandoned refrigerator. With luck the person in the refrigerator will be rescued; the shuttle crewmembers, however, must stay sealed inside the Shuttle until their mission is completed. Fortunately for the crew, a well designed and tested life support system operates to keep them safe and comfortable during their stay. The life process of animals requires oxygen and food to provide energy for activity and growth and water to facilitate transfer of materials. The waste products of this process are carbon dioxide, water vapor, heat, liquid waste, and solid waste. To sustain life inside a small sealed volume, a life support system must perform the following functions in roughly this order of importance: removal of carbon dioxide (CO2); removal of heat; supply of oxygen and water vapor removal; supply of water and liquid waste control; and supply of food and solid waste control. For relatively small volumes, carbon dioxide (CO2) removal must be managed quickly because within minutes (or, at most, a few hours inside space vehicles with larger volumes) the carbon dioxide level can be high enough to cause discomfort, unconsciousness, and then death. Carbon dioxide removal was the subject of this test. From the beginning of the space program, lithium hydroxide (LiOH), a dry granular chemical, has been used to adsorb carbon dioxide from spacecraft cabin atmospheres. It is a simple system; a fan circulates cabin air through canisters packed with LiOH. The expended canisters are replaced with fresh canisters as needed. After the mission, the expended LiOH is dumped. However, for long missions, such as will be required for construction of Space Station Freedom, the amount of LiOH required would weigh too much and take up too much valuable space in the cabin. TV Monitors provided view inside chamber. Three views of the inside of the chamber were shown in the control room. 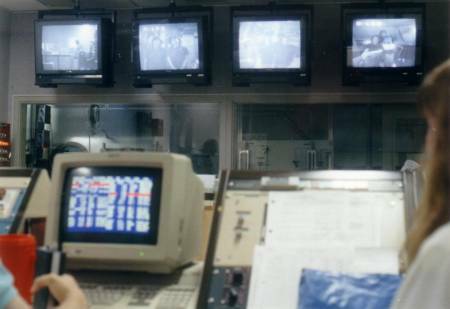 The fourth monitor displayed the view of the control room being transmitted to the crewmembers. A 'night-vision' TV camera was used at night to provide a warning of any flash or light source that might haven't indicated a fire. Another chemical system has been developed which can adsorb carbon dioxide from the cabin air and then be regenerated by exposure to vacuum (which of course is readily available in space). By using two containers of the chemical, one can adsorb CO2 while the vacuum of space removes CO2 from the other. Thus the same chemicals can be used over and over. The system, called the Regenerable CO2 Removal System (RCRS), weighs less than and takes up much less volume than the canisters of LiOH required for a fourteen day Shuttle mission. The RCRS was thoroughly tested for its CO2 removal capability and for the absence of harmful side effects on the cabin atmosphere before being declared safe for use with humans. 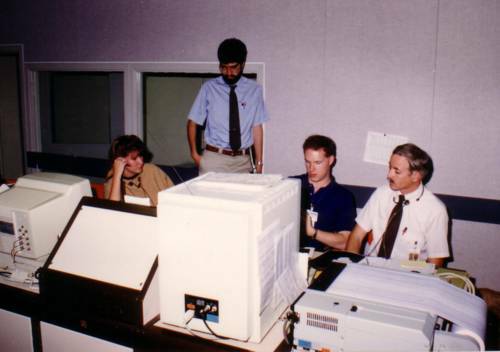 However, before use on an actual Shuttle mission where a return to safe conditions in the event of a problem could have taken hours, it was necessary to perform one final test to demonstrate operation with actual humans breathing the air from which the RCRS was removing CO2. 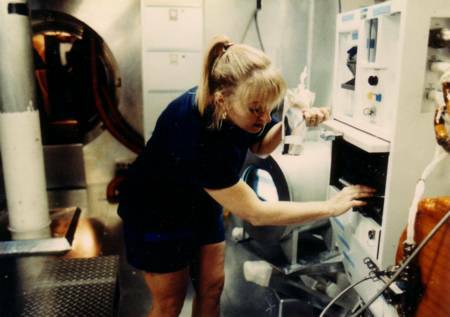 This final step in testing life support systems is generally called “man-rating” (or human-rating) and it is done in test facilities which provide monitoring of all critical measurements relating to human safety and which have rescue systems and personnel in place to remove the crewmembers from the test environment quickly and safely if an emergency occurs. When the test of the system has been successfully completed, the system is considered ready for the stringent requirement of operating in space. This was written in May 1992. It was my understanding that the RCRS would only be installed in the Columbia orbiter, so I guess it’s gone now. 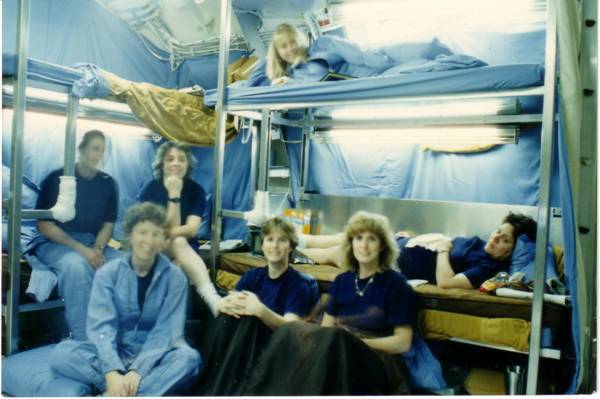 The following photos and text describe the accommodations provided to make the facility livable for a crew of seven for sixteen days. We divided the test period so that both women and men could participate and so that the stay for each group would only be eight days. The formal report on the operation of the RCRS is not included here. 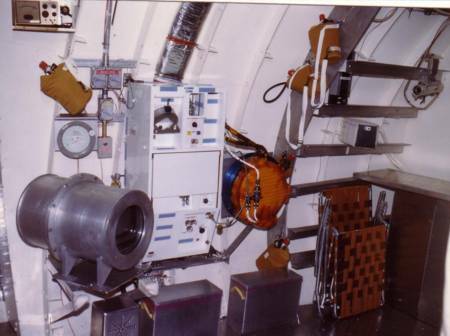 The shuttle Orbiter Repackaged Galley is shown mounted on the middeck wall to the right of the emergency switches. This is the certification test unit which had been down-graded to Class III. It was borrowed from the simulator training area in Building 35. It had been installed several months earlier for a functional verification. The galley water heater is mounted on the right of the galley. Other food preparation and storage equipment shown are the MRE oven, food preparation shelf, and food storage cabinet. The refrigerator is shown in the photographs of the sleeping accommodations. Just to the left of the galley, below the emergency switches, is the facility auxiliary chilled water dispenser. Other test support items in the photograph are the television monitor in a pressure container, the audio speaker below the television, two transfer containers, four emergency air packs, a Stentofon communication station above the MRE heater, a folded lounge chair with flame resistant webbing, and the forward closed-circuit television camera. 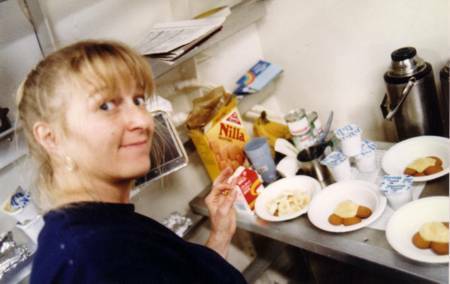 This photograph shows the galley water dispenser in use for reconstituting a beverage from the flight food supply. The test crewmember holds a flight beverage container in her left hand. The dispenser can dispense hot or cold water in pre-selected quantities. In practice, the water dispensed is usually less than the desired amount. This problem was attributed to air bubbles in the water supply. This photograph shows the galley oven in use. The oven has an electrically heated surface with spring loaded pressure plates designed to hold and heat foil package food in zero-G. The foil packaged MRE entrees and bagels were also heated in the oven. A facility fabricated MRE oven was also used for heating flight foil food packages and MRE entrée packages. The flight oven also had a convection heated compartment which was used to keep hot-water reconstituted flight vegetable packages warm. This photograph shows the imaginative combination of breakfast and snack items to produce a special dessert. Coffee, iced tea, and iced water were provided in stainless steel vacuum bottles such as the one in the upper right. Disposable plastic eating utensils and paper dishes were provided. 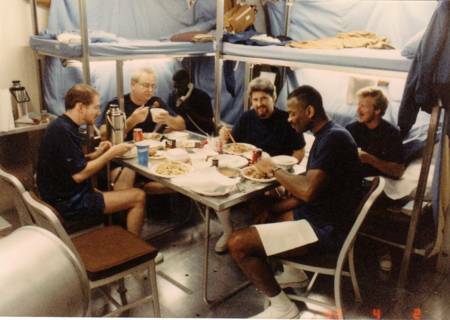 The male test crew used the folding aluminum table for meals. (The female crew used the exercise mat covered with a sheet to eat meals picnic style.) The upper photograph shows the men using the table for a meal of Chinese food ordered from a local restaurant. Left to right are Jim Skipper, Jr.; Ro Ashcraft; Charles Sampong using the middeck telephone which was a valuable entertainment and communication tool; Steve Ladner; Tony Washington; and Gary James on the bunk. Walter Frerck took the photograph using the Shuttle flight training 35mm camera that was included in the test for entertainment. 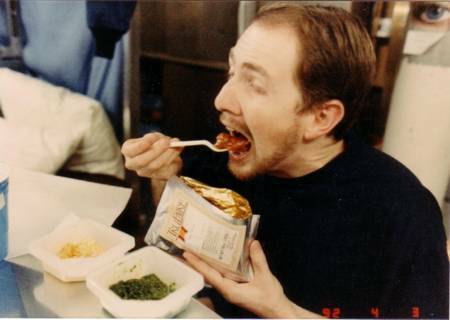 In the lower photograph, Jim Skipper, Jr. demonstrates flight meal consumption in 1-G. The crew members found that two could exercise on each step although we had not planned for that. It did allow for the exercise schedule to be completed sooner. Exercise periods were included in the test schedule for several reasons: to provide high peak metabolic loads to demonstrate the capability of the RCRS to handle high loads and also to produce a reasonably high average load. 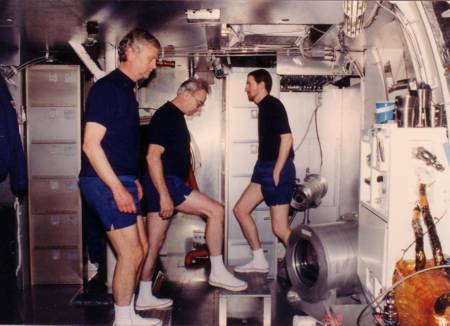 The exercise provided a structured activity to occupy the time and insured that the crew members participated in enough physical activity to avoid becoming lethargic. A step exercise was chosen for simplicity. Two of the simple aluminum platforms were made so that two crew members could exercise at the same time to produce the high peak metabolic loads. The steps were made nine inches high because the test director’s console is on a platform nine inches high. A chinning bar and a floor mat were provided to allow additional exercise at the option of the crew members. During exercise periods the crews were able to produce peak metabolic loads significantly higher than the average. The following photographs show use of the floormat and the chinning bar for optional exercise. The women did group aerobic exercises to supplement the formal exercise on the steps. Space Suit Test Subject - I was a volunteer test subject for the Gemini EVA spacesuit test before Ed White's EVA. The test was conducted at conditions equal to the cold vacuum of space. SMEAT - In the summer of 1972, NASA’s Manned Spacecraft Center (as the Lyndon B. Johnson Space Center was then called) in Houston, Texas, conducted a 56-day test in a vacuum chamber test to evaluate equipment and procedures proposed for use in the Skylab missions. STS-1 Columbia Post-flight EMU Test - Following the first flight (STS-1) of the Shuttle Orbiter Columbia commanded by John Young and piloted by Bob Crippen (SMEAT Test with Crippen) , our division chief announced that we would test one of the space suits (EMUs) from the flight to show that if had it actually been required for an emergency EVA during the flight, it would have worked properly and also that the rigors of flight had not damaged it. Space Women Firsts - There probably was no formal declaration of the space race, but from the time the first manmade object was put into orbit around the earth by the U.S.S.R, each 'first' was recorded and placed in someone's record book. There are all sorts of firsts: first living creature in space, first man to orbit the earth, first man to perform an EVA and so on. A brief review of the firsts credited to women is given here with a personal account related to one of them. Orlan Suit Test-Zvezda, Moscow - The whole purpose for my trip to Moscow was to observe an actual manned test of the refurbished Orlan spacesuit that was brought back from the Mir by the Shuttle. These photos show the vacuum chamber (vac-camera), the control consoles, the Orlan suit suspended in the chamber, and Gennady, the expert suit engineer and test subject.